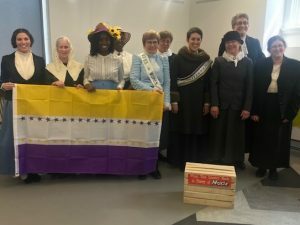 Lucy Stone, Julia Ward Howe, Clara Barton and other women from Boston who were active in the suffrage movement were brought alive on Saturday, March 30, by board members of the Boston Women’s Heritage Trail and the Jamaica Plain Historical Society. The present-day Bostonians read from these women’s writings and speeches that revealed their determination to be able to vote and thereby participate fully in the political life of the country. The audience members of more than 100 people were moved to hear of their struggles and to relate to those issues that women still seek to overcome today. 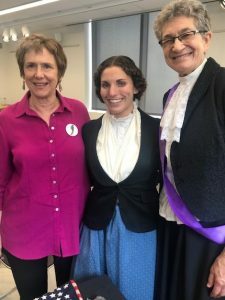 Judith Kalaora, from History at Play, portrayed Lucy Stone, one of the most important figures in the woman suffrage movement. The event was co-sponsored by the Boston Women’s Heritage Trail and the Jamaica Plain Historical Society.